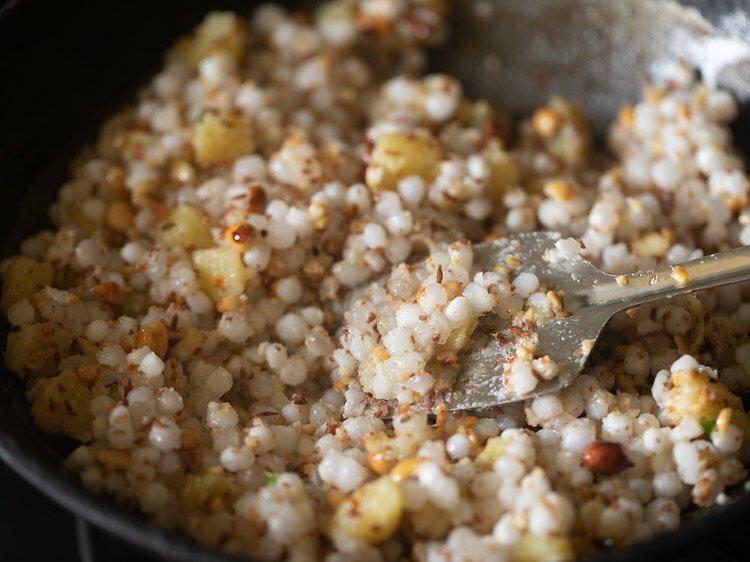 sabudana khichdi is a delicious dish of tapioca pearls (sago) made with potatoes, peanuts and usually had during hindu fasting days like navratri, ekadashi, mahashivratri. 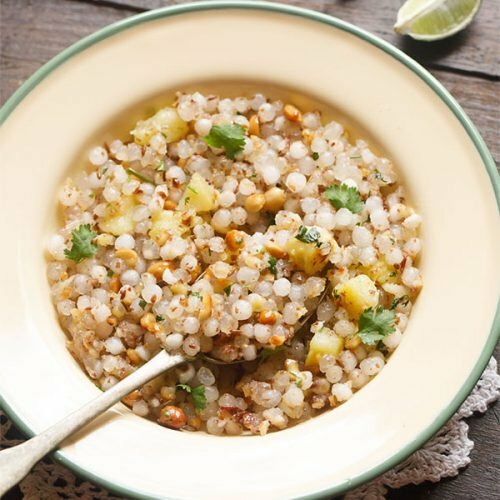 sabudana khichdi is also a gluten free recipe. 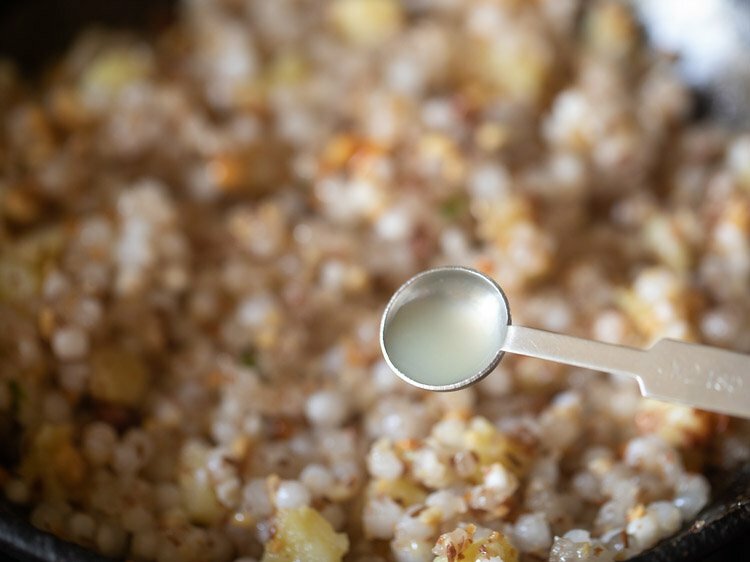 in this recipe post, you will get many tips and suggestions to make the best non-sticky sabudana khichdi. 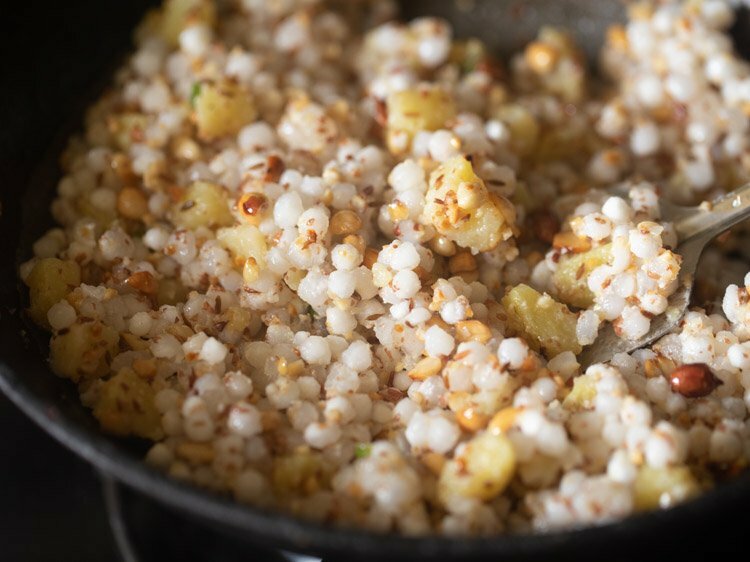 sabudana khichdi recipe with video and step by step photos. 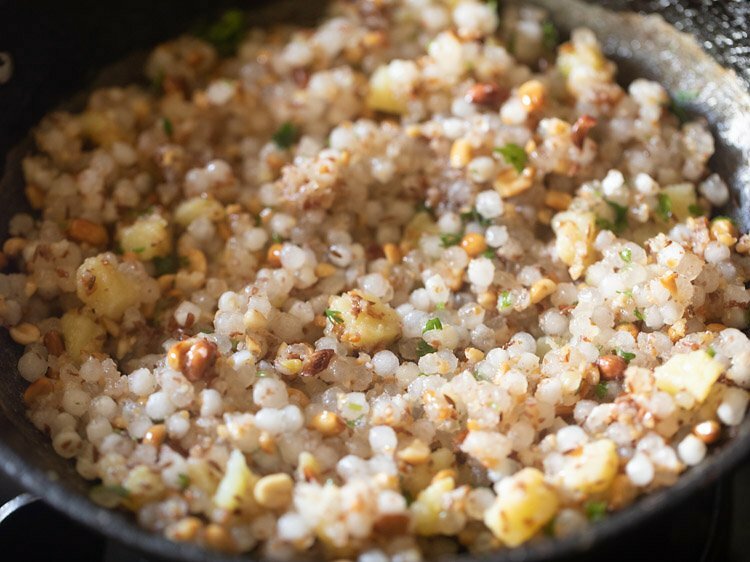 sabudana khichdi is usually made during fasting days like navratri or mahashivratri or ekadashi. 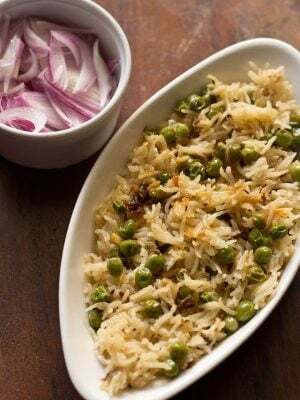 sabudana khichdi is an easy snack and is a good recipe to be made during fasting days but it requires little experience to get the perfect nonsticky texture in the sabudana pearls. 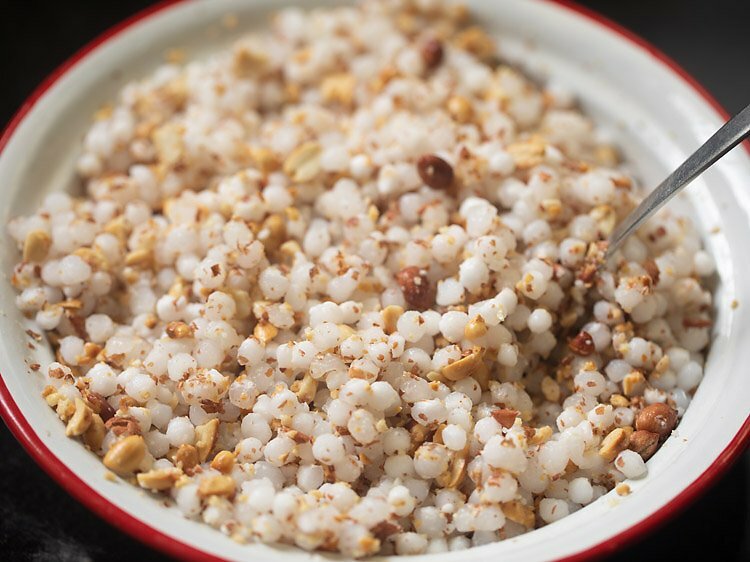 when you make the sabudana khichdi, you have to adjust the soaking time as per the type of tapioca pearls. for some pearls 2 to 3 hours is fine. for some you don’t even need to soak them in water. just cover the pearls with water for some time and you are done. so do soak the sabudana pearls accordingly. in this step by step version of sabudana khichdi, i am showing the overnight soaking method. however, please feel free to adapt the soaking time as per the quality of tapioca pearls you have. this is a maharashtrian style of making sabudana khichdi. a snack which i have grown up having umpteen times. the khichdi is loaded with carbohydrates and the proteins coming only from peanuts. 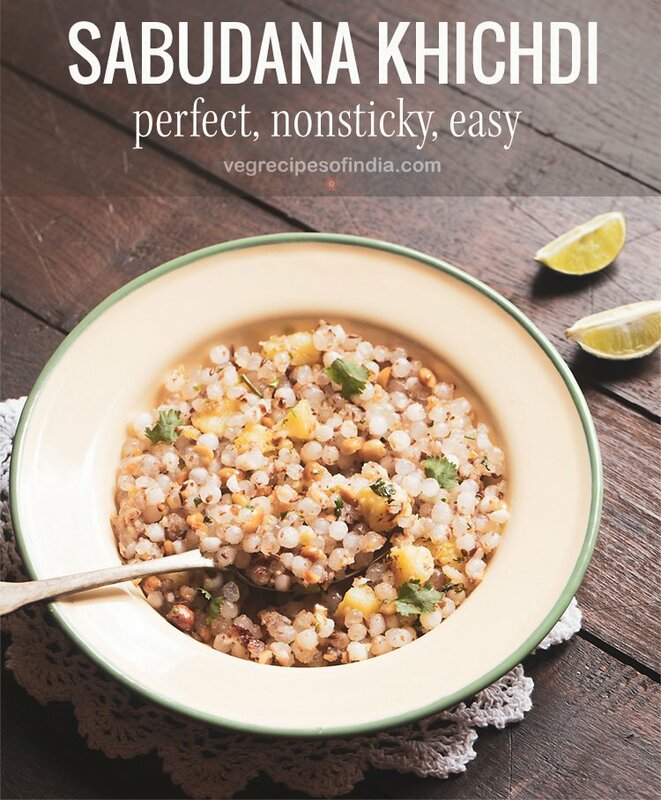 i am sharing below some tips shared by readers as well as by myself to make a nonsticky sabudana khichdi. 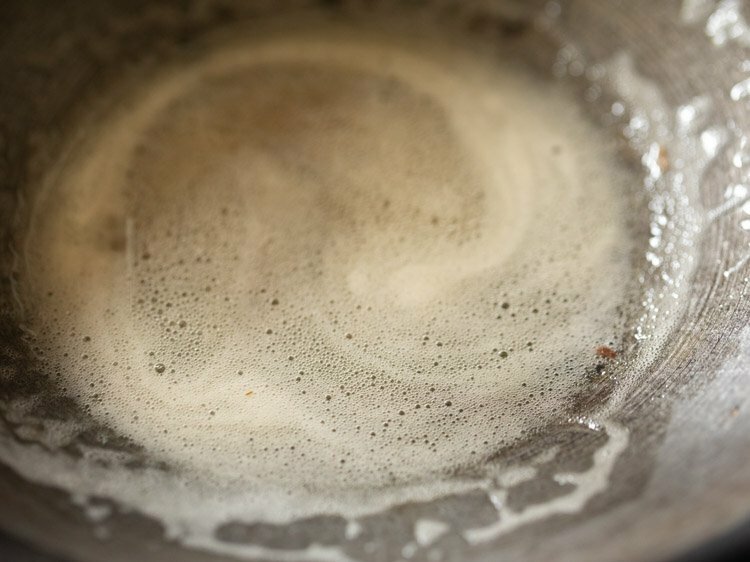 1. rinse the sabudana pearls in a colander under running water very well until you feel that all starch is rinsed and washed away. 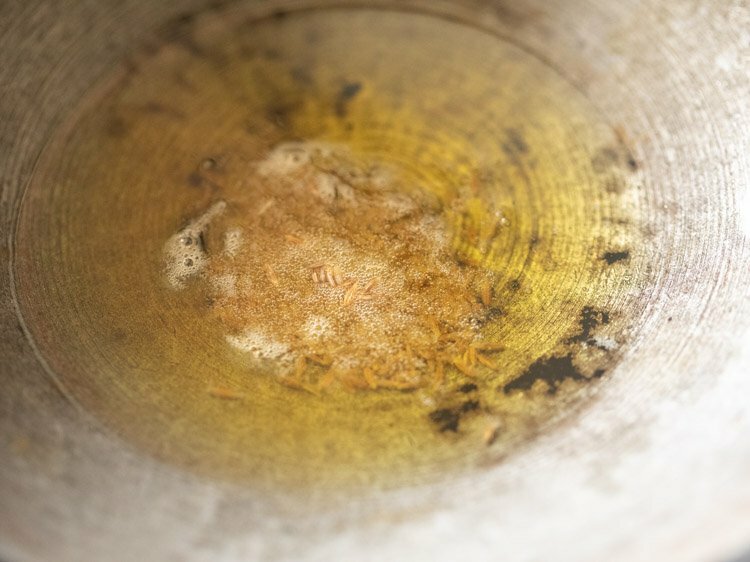 2. transfer the washed and drained sabudana in a bowl. 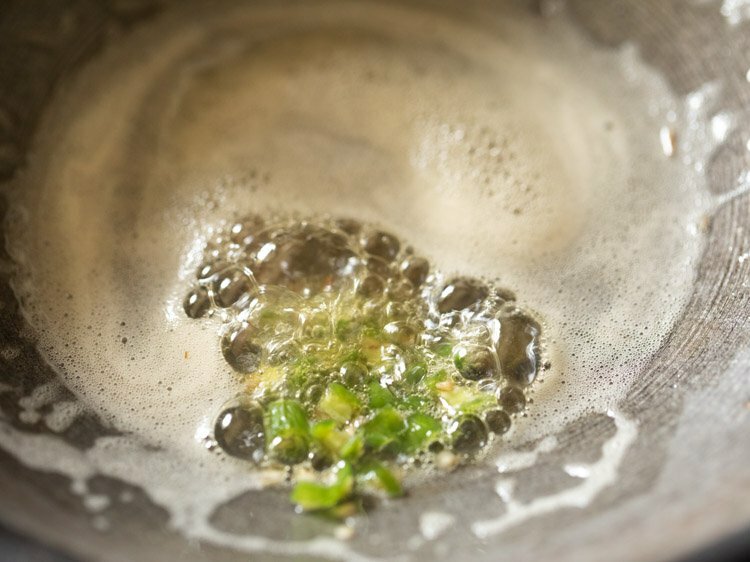 add water with its level just above 1 to 1.5 inches in the bowl. 3. cover the bowl and leave the sabudana pearls for 3 to 4 hours or overnight. the time duration will depend on the quality of sabudana pearls. 4. in the morning before you begin, check on the soaked sabudana. press a few pearls. they should mash easily. if you feel some hardness in the center, then add a few tablespoons of water and leave for 30 minutes more. 5. depending on the quality of sabudana, it can take less or more hours for soaking or will require less or more water. 6. using a colander or a sieve, strain all the water from the sabudana. the water has to be strained very well. 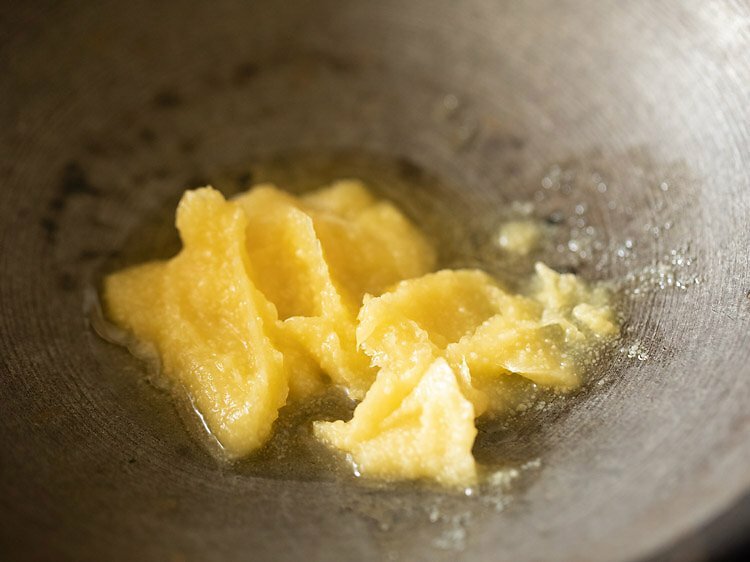 excess moisture or water can make the khichdi mushy, sticky, lumpy and pasty. 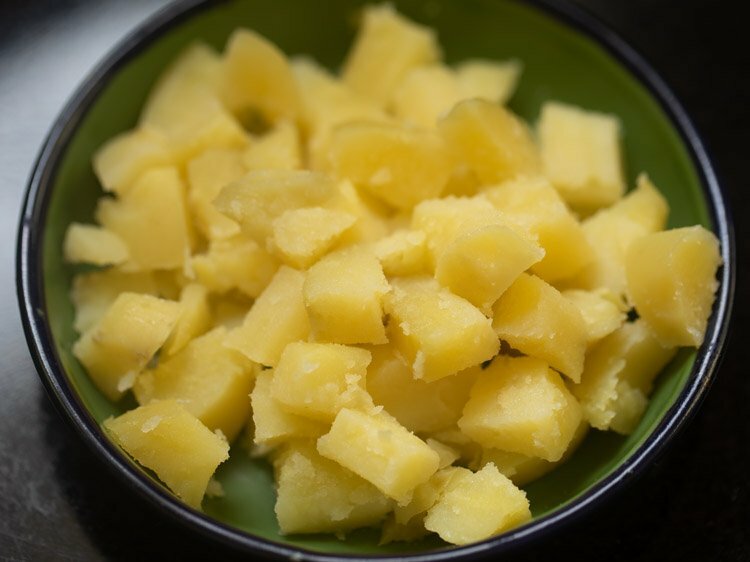 7. potatoes can be boiled, steamed or fried before adding to sabudana khichdi. 8. do not overcook sabudana, as then they can become dry and dense. 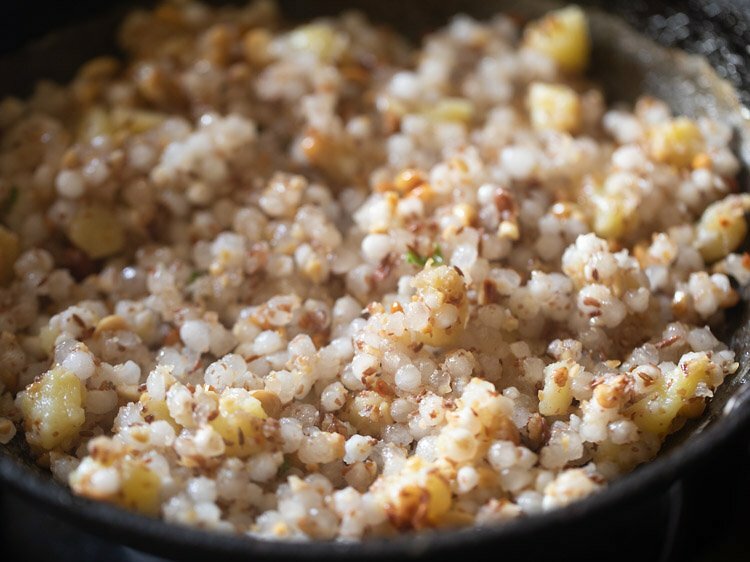 1. cook the sabudana khichdi in a frying pan. it kind of helps in keeping the tapioca pearls dry and separated. besides having to use very little oil. 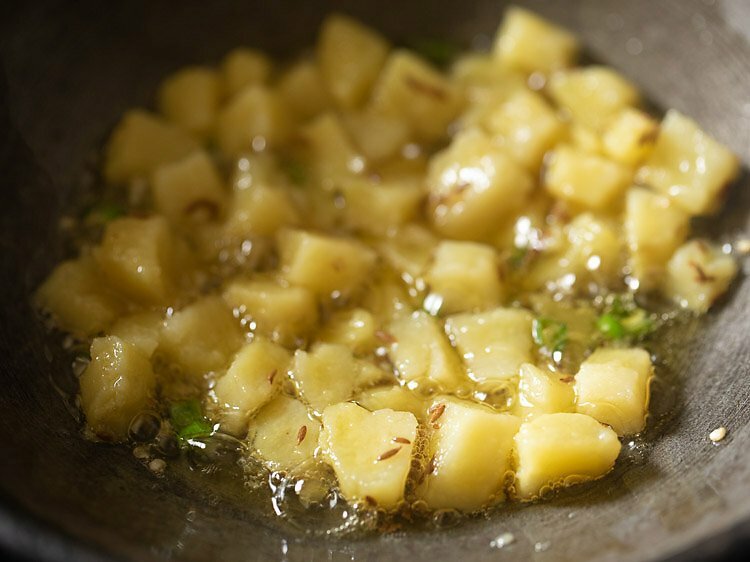 2. in a pan heat oil, add jeera and curry leaves and fry a little, then add potatoes cut into small cubes and fry on sim till the potatoes cook. alternately you can cover with the lid to speed up the cooking. 3. in the meantime mix together, soaked and drained sabudana, crushed peanuts, chopped cilantro, salt, little black pepper powder, red chilli powder, chopped green chillies and mix this mixture with hand. keep aside. 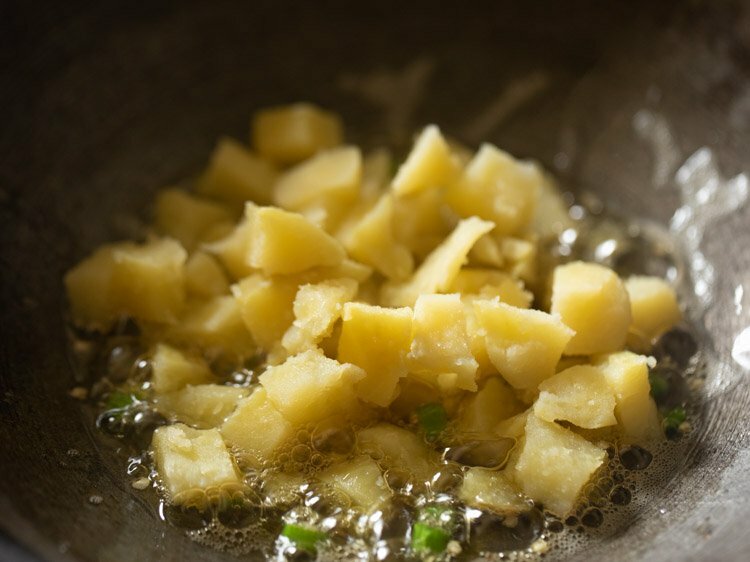 4. check if potatoes are cooked and once done add this mixture to the potatoes and mix well. 5. check for salt and drizzle very little water on the mixture and cover and cook on slow fire for 2 mins. open, mix well and enjoy sabudana khichdi with roasted papad. rinse sabudana very well in water. then soak sabudana overnight or for 3 to 5 hours. now heat peanut oil or ghee. fry the cumin first till they crackle and get browned. now add the curry leaves and green chillies. fry for a few seconds and then add the grated ginger. both curry leaves and ginger are optional and can be skipped. saute for a couple of seconds till the raw smell of the ginger goes away. now add chopped boiled potato and saute for a minute. add the sabudana. keep on stirring often on a low flame for approx 4 to 6 minutes. when the sabudana loses their opaqueness and starts becoming translucent they are cooked. don't overcook as they might become lumpy and hard. switch off the flame and add lemon juice and chopped coriander leaves. mix well. 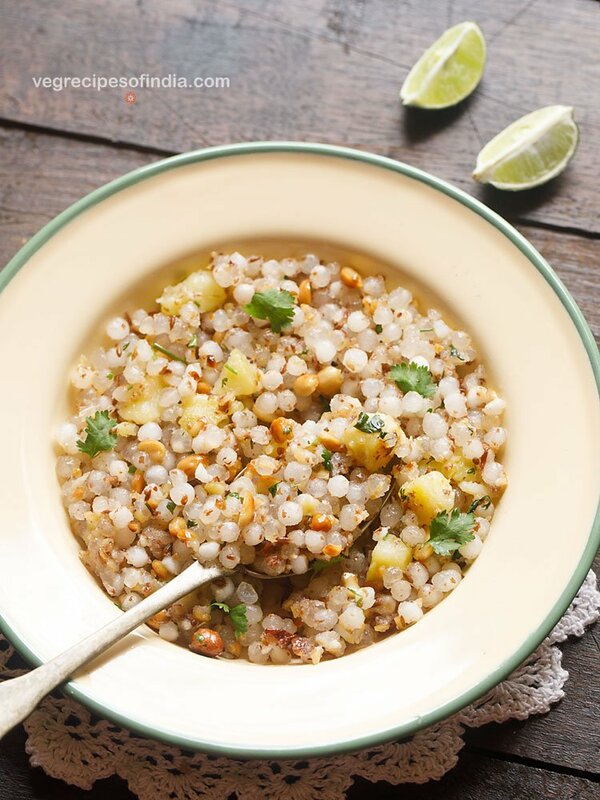 while serving garnish sago khichdi with a few coriander leaves and drizzle with some lemon juice. 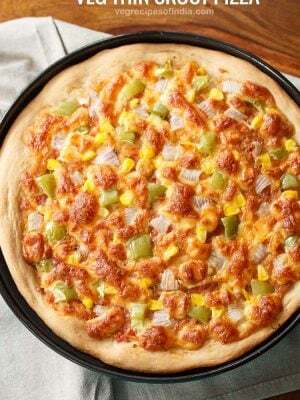 you can even add some grated fresh coconut on top. rinse the sabudana pearls very well in water. depending on the quality of sabudana you soak them in less or more water or for less or more time. after the sabudana pearls are soaked well, drain all the water very well. potatoes can be boiled, steamed or fried and then added to sabudana khichdi. 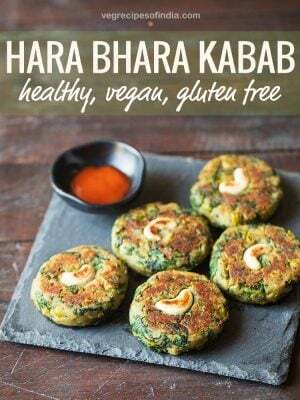 you can skip green chilies and coriander leaves if you want. 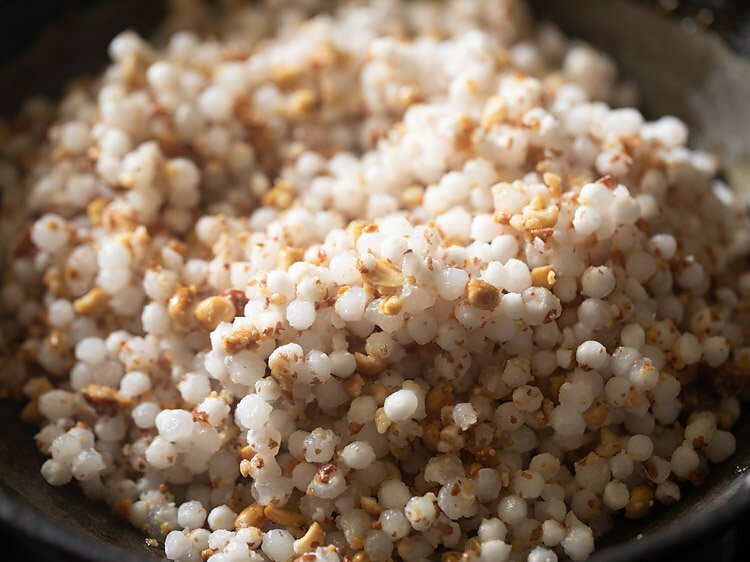 for hindu fasting during ekadashi, navratri, mahashivratri, please add rock salt (sendha namak) in the sabudana khichdi. 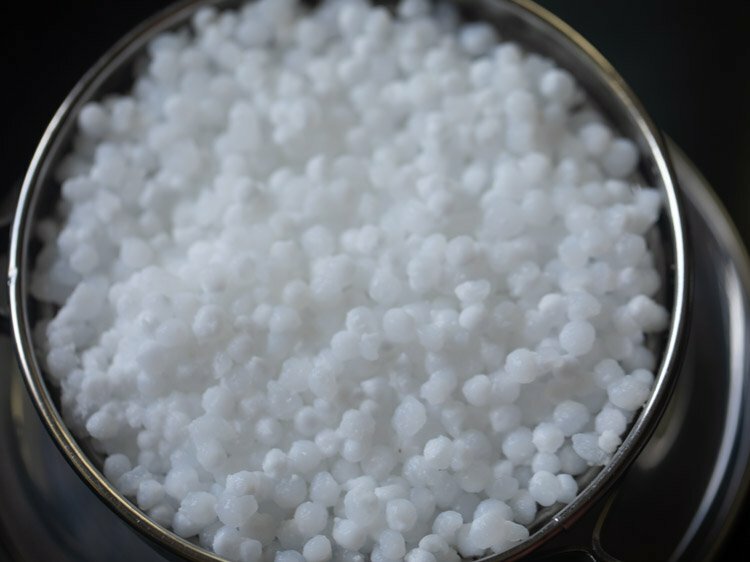 1. rinse 1 cup sabudana or tapioca pearls a couple of times in running water until all the starch is washed away. you can use a colander while rinsing. soak the sabudana in water. the water level can be 1 to 1.5 inches above the sabudana. in the below picture, the sabudana pearls are already soaked. 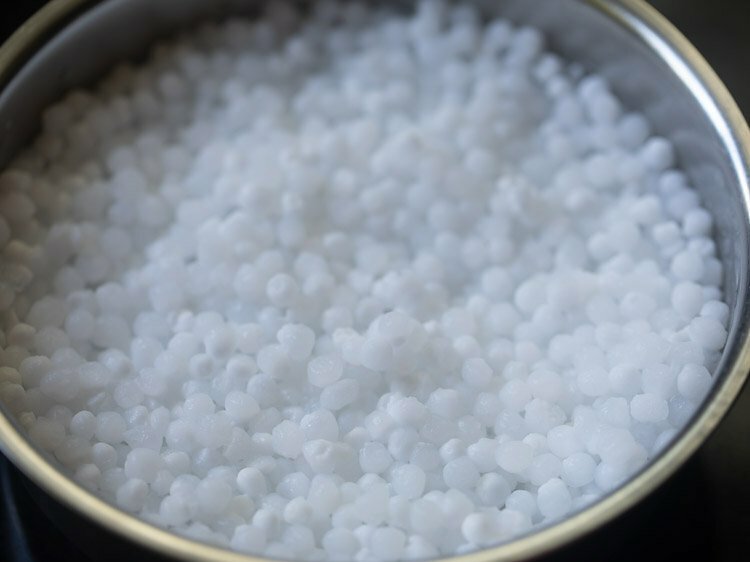 depending on the quality of sabudana pearls you can soak them overnight or for some hours. i always soak them overnight since even after soaking them for 2 to 3 hours, they don’t soften. 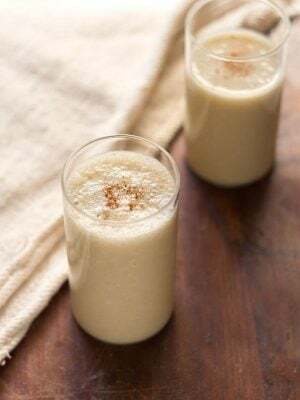 2. to check if the sabudana have become soft or not, you should be easily able to press the sabudana and it should get mashed up easily. 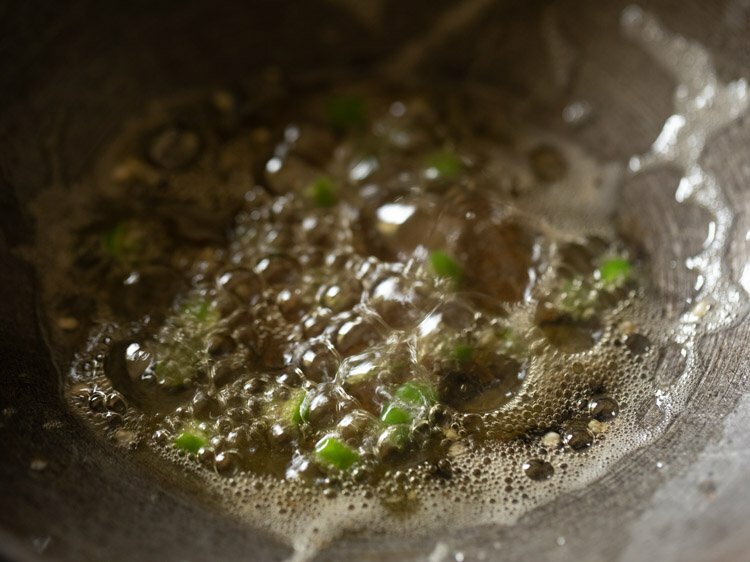 if there is some hardness in the center of the sabudana pearls, then add a few tablespoons of water in the bowl. cover and leave for 30 minutes more. 3. using a strainer or colander strain all the water from the sabudana pearls well. do strain very well as there should be no extra water in the sabudana. keep aside. 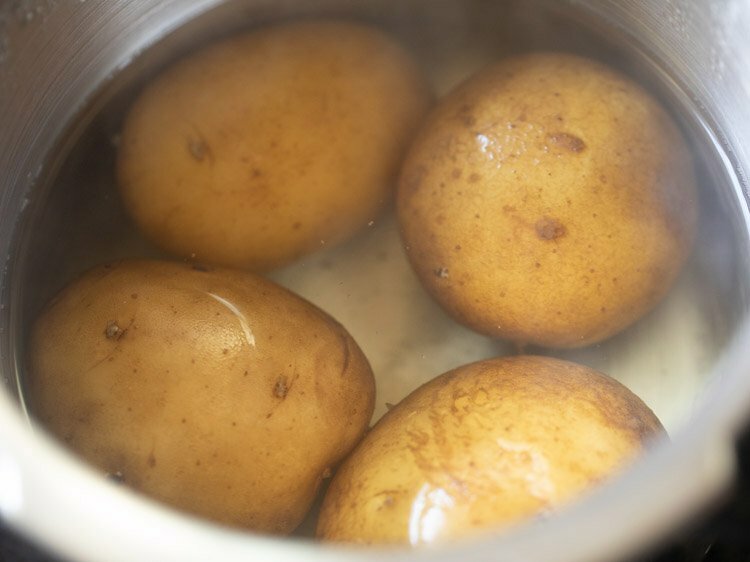 4. when the sabudana pearls are getting soaked, you can boil potatoes in a pan or in a cooker and keep aside. for pressure cooking, just add enough water covering the potatoes and then pressure cook for 4 to 5 whistles on medium flame. 5. when the presure settles down on its own, open the lid. remove the potatoes and let them become warm or cool completely. then peel and chop them. 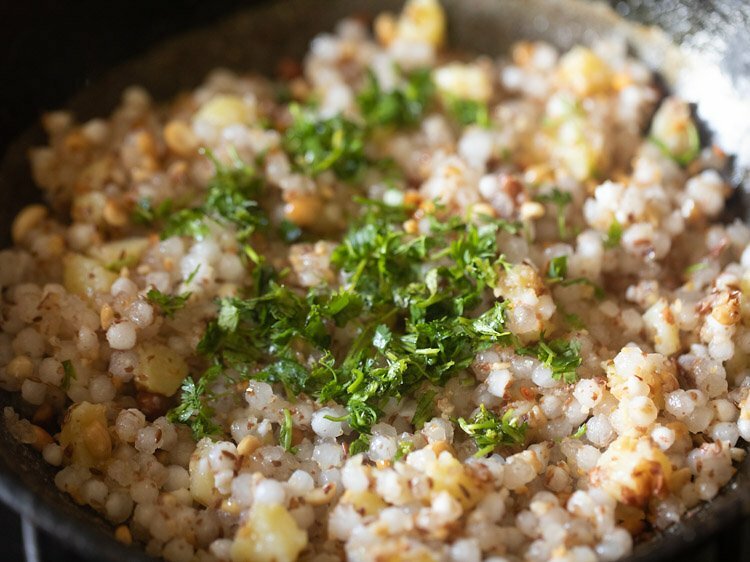 instead of boiling potatoes, you can even shallow fry potatoes and then add them to the sabudana khichdi. 6. heat a kadai or a frying pan. 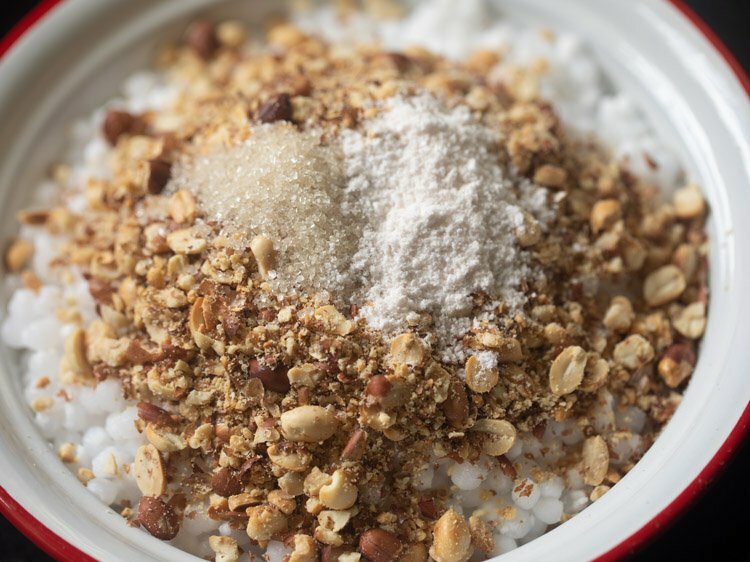 add ½ cup peanuts (moongphali). 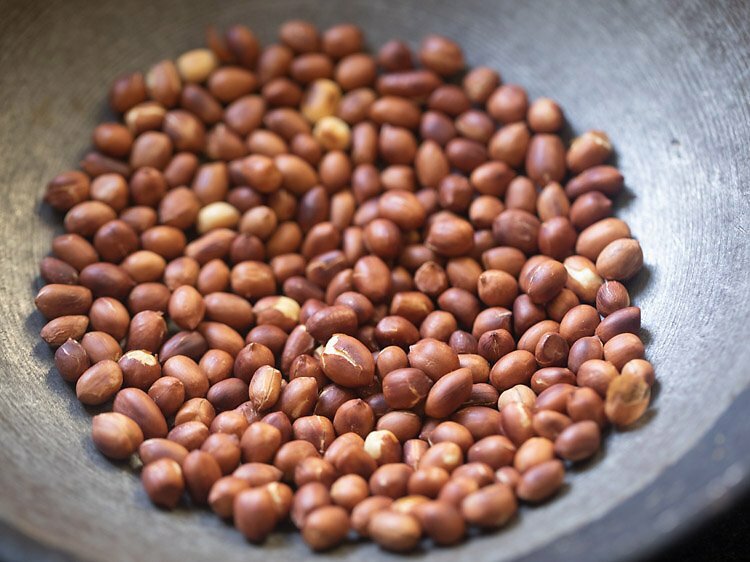 7. keep flame to medium-low and stirring often roast the peanuts. 8. roast till the peanuts become crunchy. 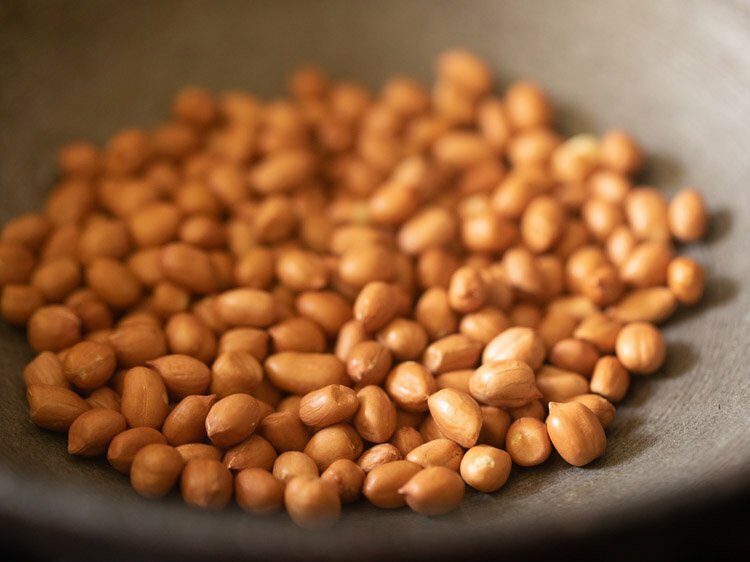 you will see the peanut skins getting browned or charred. 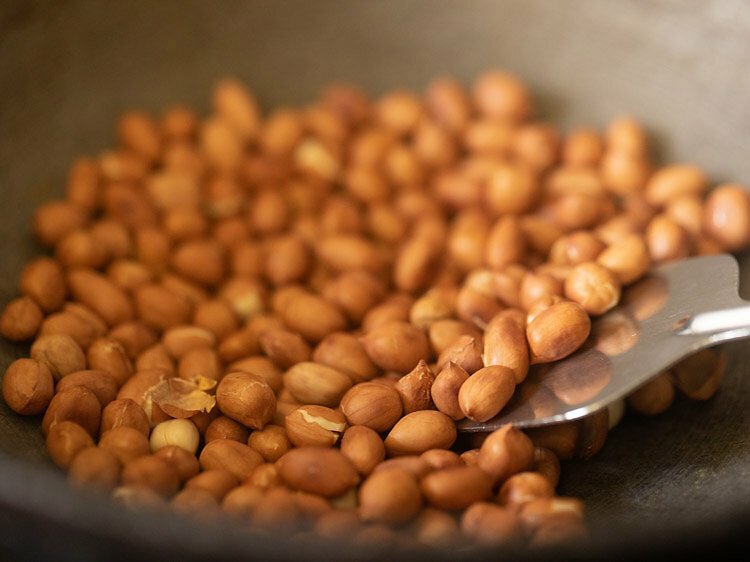 9. switch off the flame and keep the peanuts aside to cool. you can remove the peanut skins if you want. 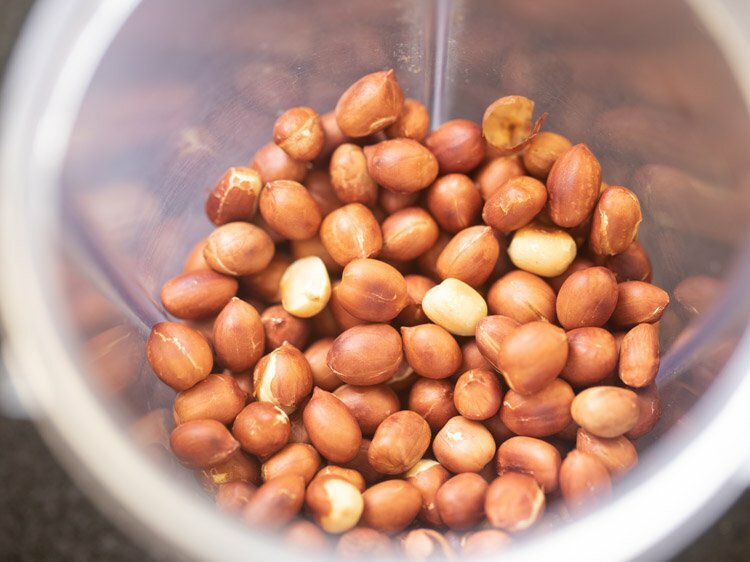 10. add the cooled roasted peanuts in a small grinder jar. 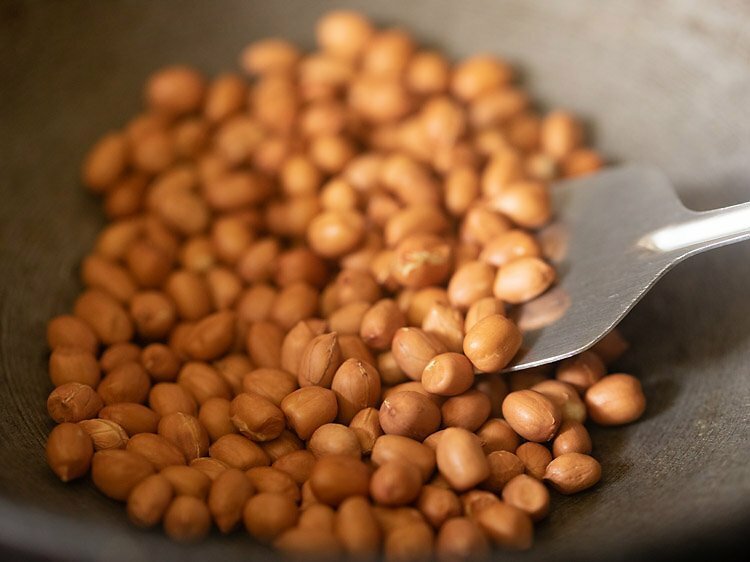 11. using the pulse option powder the peanuts coarsely. do not grind at a stretch as then the peanuts will release oil. grind in parts and for a few seconds as we just need to make a coarse or semi-fine peanut powder. 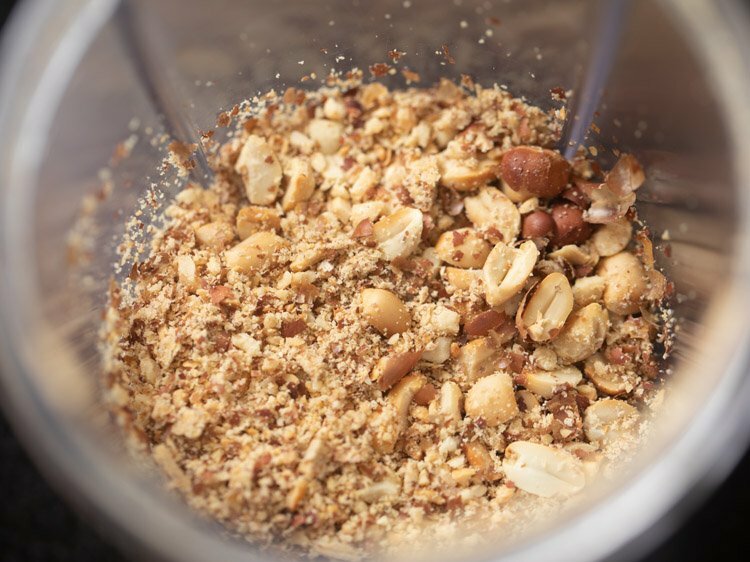 you can even coarsely powder the peanuts in a mortar-pestle. 12.take the sabudana pearls in a mixing bowl or a plate or tray. then add the peanut powder in the bowl containing sabudana. 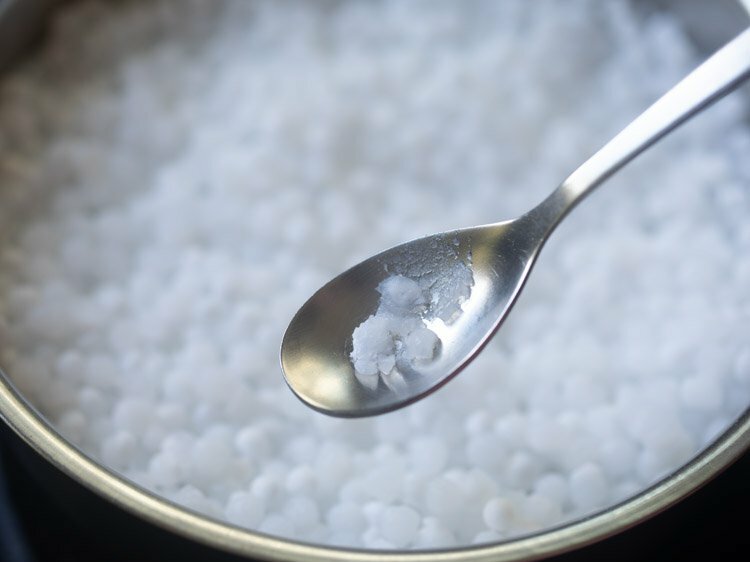 13. also add rock salt (sendha namak) as per taste and ½ to 1 teaspoon sugar. 14. mix very well with a spoon. 15. heat 3 tablespoons peanut oil or ghee in a heavy kadai or pan. 16. add 1 teaspoon cumin seeds. 17. let them crackle and get browned. 18. then add 1 chopped green chilli. 19. fry for a few seconds on medium-low flame. 20. now add the chopped boiled potatoes. 21. mix and saute for a minute on medium-low flame. 22. next add the sabudana + peanut powder mixture. 24. saute the sabudana pearls on a low flame stirring continuously for approx 4 to 6 minutes. 25. saute till the sabudana become translucent. switch off the flame. do not overcook as the sabudana can become lumpy and dense. 26. then add 1 teaspoon lemon juice. 27. add chopped coriander leaves. 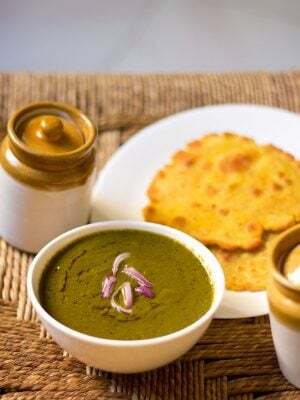 if you do not have coriander leaves during fasting, then you can skip them. 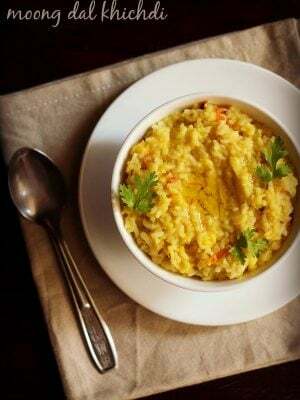 29. serve sabudana khichdi hot. 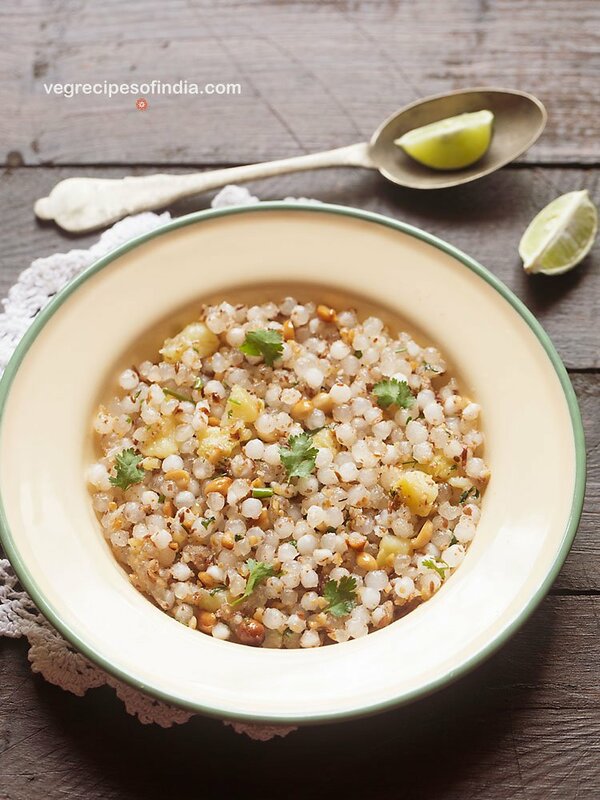 while serving you can also garnish sabudana khichdi with a few coriander leaves. 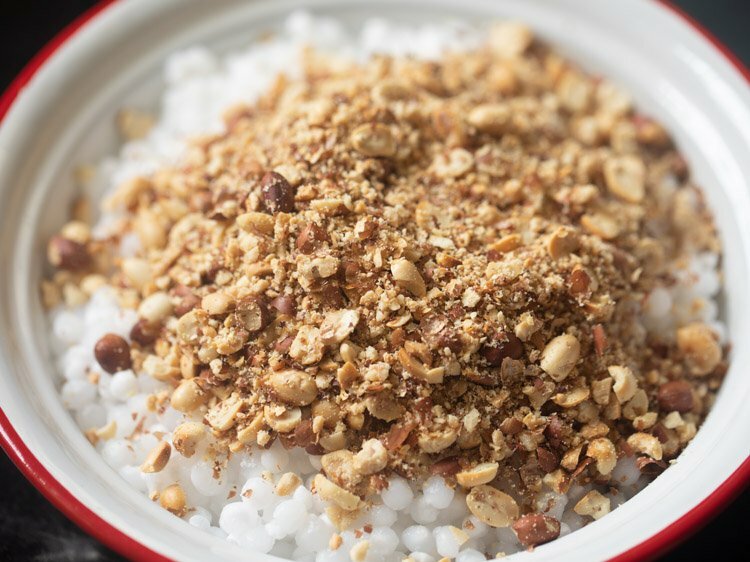 you can also garnish with some grated fresh coconut. Best wishes to you, your staff and all your readers. Belated Happy New Year. no problem vidwan ji. you can always write. your comments have a lovely humor in them. 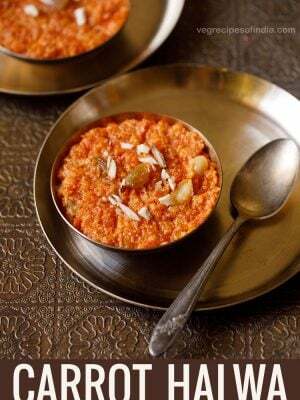 loved the variations you made in the sabudana khichdi like red chili powder, curry leaves powder. i am not a fan of msg, so i do not add it in any food that i make, but yes i do know folks who swear by it as it perks up the flavors in the food. i was not aware curry leaves is so expensive in US. of course substituting curry leaves powder is a good idea. You can get curry leaves for cheap in an Indian store or just grow them in your backyard. Hi Dassana, I am a South Indian and believe me my gujju friend was proud of this kichidi. Thank you sooo much 🙂 your blog is kinda the go to place for me when I think of cooking something outside the world. You have never failed me. Welcome Chella. Thanks for your appreciation and positive feedback. Love and Regards. The sabudana khitchdi was perfect ! I came to your website, by habit, and since I know the instructions, by heart, I only read the headlines … 😉 ….. that was enough to boost my confidence. I added a teaspoon of wet coconut cream …. and two sprinkles of Hing, which I now notice, is not even there, in your ingredients 😉 …. anyway, no harm done, since I can’t taste the Hing, in the prepared dish. lol. Best Season’s wishes to you and your ‘staff’ ( hubby ? ) … and to all the readers. thats a lovely as well as humorous comment. potatoes can always be added more. more the better. glad that the sabudana khichdi worked for you. coconut cream is good and so is hing. some folks do add hing if not making sabudana khichdi for fasting. best season’s wishes to you and your wife. thanks a lot.